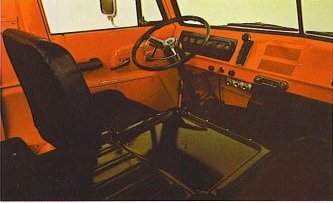 Displayed below are the images and text from an original 1965 Dodge A100 brochure. To see the first part of this brochure CLICK HERE. A huge cargo box with on of the widest tailgates on the market makes the Dodge compact pickup the answer to your search for a pickup with toughness to do the job. To increase the usefulness of the cargo box even more, the Dodge compact pickup is provided with stake pockets for side panel or roof bow installation. Inside the cab, there is extra storage room behind the passenger seat for items to be kept under lock and key. 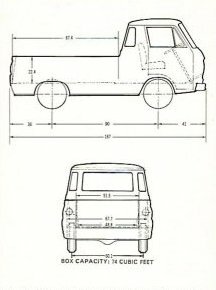 DIMENSIONS AND CAPACITIES – No other compact pickup offers as much fully useable flat floor space as the Dodge compact pickup, (compare Dodge dimensions with those of other compact pickups). 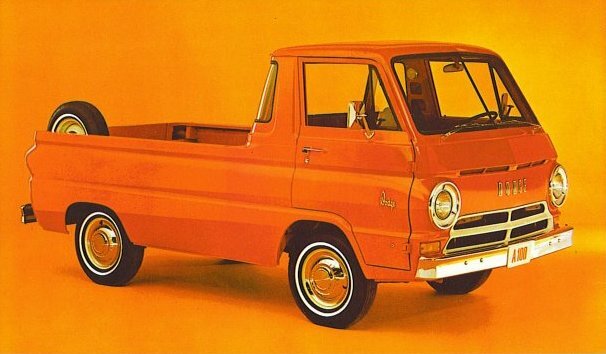 The Dodge A100 pickup will carry a maximum payload of 2130 pounds. 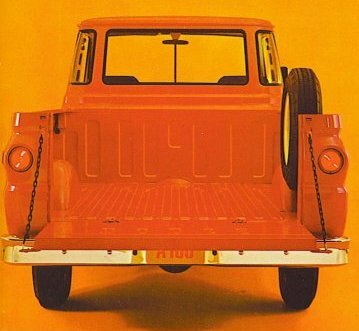 3800-POUND GVW with a payload capacity of 920 (front axle rating, 2200 pounds; rear axle rating, 3000 pounds) is standard on the Dodge A100 Pickup. 4600-POUND GVW – To increase the GVW of the Dodge to pounds (and payload to 1655 pounds), add 6.70 x 15-4 PR tires mounted on 15 x 5.00 wheels. 5200-POUND GVW – For maximum GVW rating (5200 pounds, with 2130-pound payload capacity), the necessary equipment is available as an optional package and includes these components: front stabilizer bar, body channel reinforcement, 7.10 x 15-6 PR tires mounted on 15 x 5.00 wheels, 2500-pound-capacity front axle with 11″ x 2.75″ front brakes, 1100 pound capacity front springs, 3600-pound-capacity rear axle, 1410-pound-capacity rear springs, and heavy-duty, three-speed transmission with 10″ clutch (or three-speed LoadFlite at extra cost). TWO-TONE PAINT OPTIONS – Like all other Dodge compact truck models, Dodge compact pickup trucks are available with an extra-cost, two-tone paint option. The second color consists of a wide band around the truck’s body and cab, providing a long, sweeping appearance. OPTIONAL REAR QUARTER WINDOWS – Rear quarter windows in the Dodge compact pickup are available either as part of the optional custom package or as a separate option. As you can see they afford greater visibility for drivers who do a lot of maneuvering in heavy traffic and cramped quarters, such as loading docks. 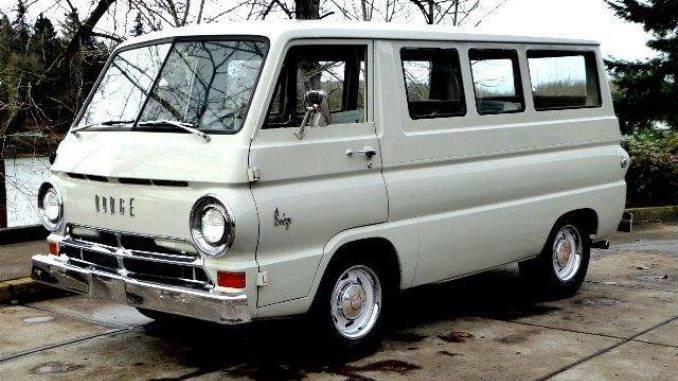 Includes armrest for driver, cigar lighter; coat hooks; bright horn ring; bright hubcaps; cab compartment interior insulation; right side sun visor, and cab rear quarter windows. All equipment in the pickup Custom Package except coat hooks and cab compartment interior insulation is available as separate option.